Shooting with One or Both Eyes Open? →Shooting with One or Both Eyes Open? There are many components that come into play when one is hunting. One of the most important aspects to pay attention to is your visual field. As many know, the gear one obtains is quite important, but more so, how a hunter sees their target can affect hunting accuracy, tremendously. Whether you shoot with one eye or two plays a great significance in your success. As with anything, finding a method that is comfortable and successful, for you, is the key to mastering any skill. Depending on what you are aiming for as a hunter, one or two eyes open can work, because both can provide specificity to what a hunter can accomplish. When you are aiming at your target, you want your field to be clear and visible. From your eyes, information is sent to your brain, where visual information is processed, so you may accurately find your target, reacting to what you are seeing. When someone first is learning how to shoot, using one eye is most common, as that is how it is taught and advertised today. When you are shooting, there tends to be a dominant eye, which can provide excellence in one eye shooting, as the companion eye can tend to get in the way or mess with your visual. Yet, with both eyes, the equal measurements of information is sent to the brain, giving the hunter extremely accurate direction to act on. Both eyes provide in their own ways, but knowing the information to accompany your comfort is necessary to crafting your skill. Shooting with one eye open when aiming is a common and popular method hunters use, especially in the beginning, when they are learning how to shoot. In certain situations, shooting with one eye tends to be more comfortable and a better tool than with two eyes. For instance, when someone is using a rifle to shoot at their target, the rifle must align up to their right or left shoulder. In this, the technique for propping up the gun to hold, aim, and shoot, is primarily dependent on a certain side of the body. 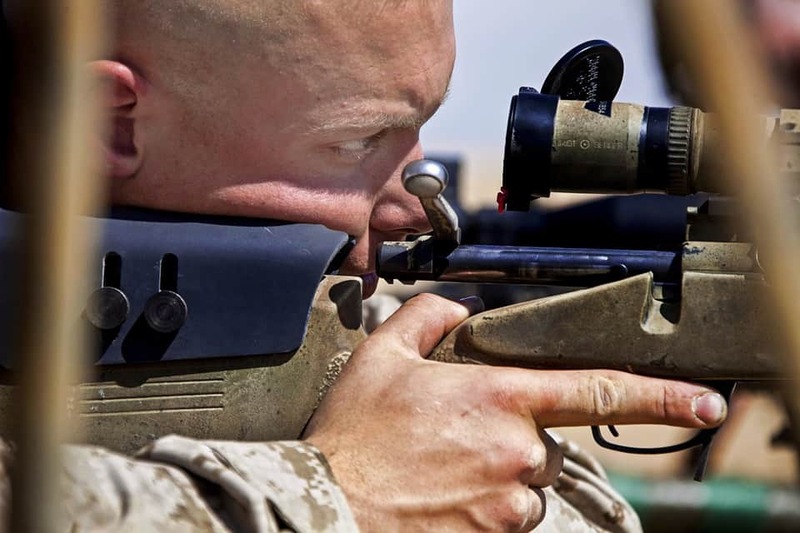 The eye of the left or right side will align with the rest of the body as well as the rifle. Sometimes the companion eye does not help with aligning the visual image when you are in the proper stance for shooting. When this happens, one eye can very much be more beneficial than shooting with two eyes. The dominant eye is sometimes referred to as the master eye. There are many successful opportunities and situations to shoot with one eye, even though, for most hunters, two eyes tend to be the preferred method of shooting. Depending on the hunter, the situation, the scope used as well as the comfort level, one eye can be far more successful and dominant. More than not, shooting with two eyes open is the preferred method for aiming. When you are utilizing both eyes, you can get an accurate visual image that is properly transmitted to both sides of the brain. If both sides of the brain are seeing the image, a proper calculation can be made, giving the hunter a chance to quickly react and calculate their target and percentage of success better. The biggest difference when choosing whether you keep one eye or both eyes open when shooting is the organ itself. Two eyes open when shooting is far more practical, as accuracy tends to be more consistent, based on how the eyes function. The lighting plays an effect on the eyes as well; the cones and rods within the organ of the eye utilize not only the image, but the lighting of the visual field being displayed. Due to these facts of what the eyes, as organs, need for success, using two eyes will give the hunter more descriptive detail in terms of color, speed, dimension, and the balanced positioning of their aim. In other words, two eyes can increase the productivity of the hunter’s skill, bringing forth success. Yet, what truly matters is comfort, ease, and confidence in shooting as both options for visual aids can and will be successful. There are certain situations that go hand in hand with using one eye over using two eyes. One eye shooting should and can be used for learning the skill. It may be easier to start using one eye when learning to shoot because of the unfamiliar territory of aiming. More importantly, it can be helpful when someone is stretching their shot into a longer range. One eye is best used for situations where accuracy is not the ultimate goal at hand. Keeping one eye closed and one eye open can be easier at first, but as time goes by, it can cause strain on the eyes as well, affecting accuracy. For two eyes, there are many situations that are specifically useful for this tactic. Any type of shooting that is involved with a defense mechanism should be used with two eyes because you want accuracy to be there. It is important to learn shooting with two eyes for a natural habit to form; this can make real life situations easier to tackle, in terms of defense. More importantly, two eye shooting should be used in situations where you are looking to achieve accuracy in all types of hunting. ​You also have to consider whether your gear provides support to shoot with one or both eyes open. Not all scopes are good for targeting and aiming with both eyes open. It can come down to whether you have a scope that offers long eye relief or not. Depending on what you are using your shooting skills for, one or two eyes can provide success. Yet, as hunters, it is important to decide what fits you best for your comfort, confidence, and style of hunting.